The mental health of a child refers to the child’s ability to love, work, play, function and have peace of mind. It refers to the ability of the child to be happy, strong, develop and benefit from his/her environment, which includes the classroom, in problem-solving. It also refers to the affective domain of learning which enables or forestalls the operation of the cognitive domain and determines to what extent a child is able to make meaning of the learning activity. Examination, which is an instrument of evaluation by which we can place value and quantitative judgements on learner’s progress in making sense of the learning activities, has been a cause of academic stress for learners- most especially the adolescents, in the diaspora. The University of Leicester (2009) gave the definition of “stress” as the body’s natural responses to something According to Lee and Larson, 2000; academic stress refers to student’s interactions between environmental stressors, the student’s cognitive appraisal of and coping with the academic-related stressors, and psychological or physiological response to the stressors. From the above definition, we can rightly say that academic stress occurs as a result of some factors which include: the cause of the stress, the student’s awareness of the cause of stress he or she feels, the way and manner the child handles the cause of the academic stress, the response to the stress in terms of psychology and health of the child. Indeed, academic stress is a pervasive problem across countries, cultures, ethnic groups and must be viewed in its context. (Wong, Wong and Scott 2006). The purpose for which a child determines to pursue academic success varies from person to person. It could be for prestige, to carry on the family’s pride, as a result of parental expectation or to pursue higher education. As harmless all these sound, they could lead to stress on a child. The stress is usually focused on testing the child’s memory or rote learning without taking note of individual differences in learning. Stress is a function of the demands placed on us and our ability or inability to meet them. These demands are often extrinsic, coming from sources such as parents, siblings, peer groups, teachers and the school at large. As the home is the primary agent of socialization, it can assert a great amount of pressure on children. However, it is not the case that other sources do not contribute to the anxiety a child faces as a result of stress. Stress also could come from intrinsic factors, such as disequilibrium between what we ought to do and what we are actually doing. Going blank during the examination. In managing or preventing stress for children, there are various roles to be played by the home, the child and the school. These roles shall be discussed below. Eat properly. Balanced diet shouldn’t be joked with and meals, drinks, and fruits that enhance the brain (call them brain boosters) such as potatoes, pasta, fresh vegetables, milk, bananas, are students’ best friends during exams. Also, 3-squared meal should be taken by students. Avoid skipping meals because of study as studying itself tasks the brain and requires eating to supplement for lost energy. Also, for easy assimilation, never skip meals. Somethings as well should be avoided such as caffeine which is a major cause of anxiety, distortion of thoughts and preventer of sleep. Take adequate rest. The saying that “nature cannot be cheated” is really true here. Trying to cheat nature may result in slow assimilation rate, tension and anxiety. It can even cause interference in the retention process leading to forgetting. 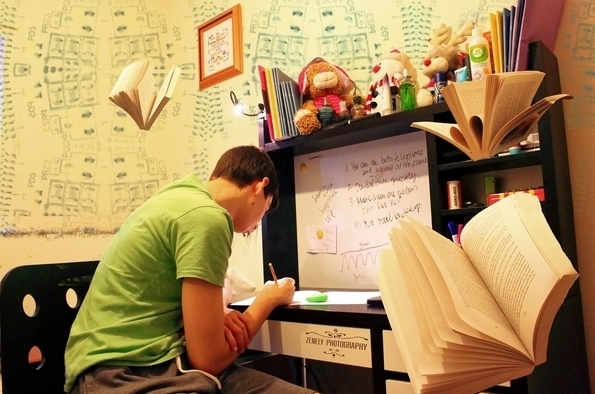 The Student Learning Development, University of Leicester suggests students should ensure to have at least a hour an half break from revision before going to bed. This break should be used in doing something relaxing such as listening to music, chatting, gisting with friends and basically, just having fun. Engage in regular exercises. This is beneficial in keeping the body healthy and helps in burning out the hormones and nervous energy produced when stressed. It helps calm the nerves when tensed. It doesn’t have to be a strenuous sport, just something that keeps the body moving would suffice. Dancing, swimming, cycling and walking are light exercises which are of great benefits to the body. Balance reading with fun. Stress could be greatly managed when you take a break to have fun. All work and no play makes Jack a dull boy. This helps you feel reinvigorated when it is time to read. Also, the feeling of isolation which accompanies stress can be eliminated when you do. So if what you enjoy doing for fun is engaging in sporting activities or debating, do it, the break itself is therapeutic. THE PARENTS: The parents are also useful in helping a child manage stress. Much of most of the pressure students feel come from their parents. They should rather assist the child in self-discovery and working out what works for him/her. Parents should be able to assist students in calming their nerves and motivating them for greatness. Also, they should be able to help them study. Making them run errands during exam period can increase their feeling of tension, so it should be minimized to the barest minimum. Also, their feeding and exercise should be motivated. The parents need to complement the efforts of the school in helping students manage stress. THE SCHOOL: The stress is usually focused on testing the child’s memory or rote learning grading them based on one final examination determines their grade for the whole teaching-learning program. Continuous assessment is the only true form of assessments and it should be encouraged in order to reduce the academic burden on students. Also, individual differences should be recognized and appreciated in the school (Riding & Rayner, 1998). A pragmatic approach given by Ozmon and Craver, 1976, “to seek out the processes and do the things which work best to help us achieve desirable ends” tell us that schools need to work out what works best for students. The school should support students by giving them the freedom to learn at their own pace rather than assume and impose examinations on them causing their mental health to fail and making them have the feeling of being failures. There are differences in cognition and at such; these differences should matter in the school’s program and classroom activity. Kumari A., & Jain J. (2014). Examination stress and anxiety: A study of college students. Global Journal of Multidisciplinary Studies. 33-40. Lee, M., & Larson, R. (2000). The Korean “examination hell”: Long hours of studying, distress, and depression. Journal of Youth and Adolescence, 29. Ozmon, H., & Craver S. (1976). Philosophical foundations of education. (pp 70) Ohio: Charles Merrill. Riding R. J., & Rayner, S. (1998). Cognitive style and learning strategies: Understanding style differences in learning behavior (pp. 6-10). London: David Fulton. The University of Leicester. (2009). Exam Stress. (pp 1-6). Student Learning Development, University of Leicester. www.mind.org.uk/ (accessed on 03/03/2018). Wong, P. T. P., Wong, L. C. J., & Scott, C. (2006). Beyond stress and coping: The positive psychology of transformation. Handbook of Multicultural perspectives on stress and coping (pp. 1-29). New York, NY: Springer.